Pressure cookers are always a good addition to the kitchen because of how much time, money, and energy; it will save you and your family in the long run. However, before you purchase the first one you see, there is a bit of research that should be done so you can be sure you are getting the absolute best for your needs. There are also a few other points to remember when it comes to the care and maintenance of your pressure cooker as well. Is it hard to clean? It can be if you leave the mess to sit for too long. But with a nonabrasive cleaner for the inside and a fine metal polish for the outside of the cooker will help keep it clean and shiny and ready for the next use. It is also safe to immerse the pressure cooker in water to clean it, and it will not damage the parts. It is always helpful to have a small brush available so you can clean the vent pipe and make sure no food got stuck. The sealing ring should also be removed after every use and cleaned to ensure that there everything is clean. What Can the Presto Cook? The Presto 01362 6-Quart Stainless Steel Pressure Cooker (See Today’s Price) cooks chicken, fish, meat, and vegetables perfectly every time. The cooking rack allows flavors to remain separate even when cooking with different foods. Even the economic cuts of meat come out perfectly succulent, tender, and full of flavor saving you money in every way possible. Not to mention how safe you’ll be as the Presto 01362 automatically maintains the proper cooking pressure with a pressure regulator that continually gives you the necessary audible signals so that you know exactly when your dinner is made. There is also something known as an overpressure plug as well, and this acts as a secondary safety feature for the pressure cooker. It is useful in case the primary vent pipe becomes blocked or clogged at any time. The air vent and cover lock indicator are two more of its vital safety features and will prevent the cover from opening until the pressure has been reduced to a safe point. The dual 64-page instruction and recipe book included is an added benefit. As is the fact that the Presto 01362 works on all three range types: gas, electric (smooth-top) and induction, making it suitable for every home. The helper handle makes carrying the Presto 01362 around both that much easier, and safer; more manageable to carry around your food with a level hand so that there is no sudden and uneven distribution of flavor after the food has finished cooking. It also makes it much easier for those who find it more difficult to carry heavy items. Aside from being dishwasher safe, the pressure cooker itself is made from high-quality stainless steel which gives it a pristine appearance while still being easy to clean. Not to mention the tri-base which sandwiches aluminum between two layers of stainless steel to ensure the highest quality heat conduction, saving time, energy, and money by providing an even heat distribution throughout the cooker, and therefore the meal. The Presto 01362 allows your food to be cooked 3-10 times faster than other cooking methods which provide you and your family with flavorful meals every time. If you’re still wary about the pressure cooker for whatever reason, Presto also offers an extended 12-year warranty showing just how much they trust it. There are two types of pressure release methods that can be employed with the Presto. The cold water method and the natural release method may be used to help relieve the pressure following the cooking process. This particular model doesn't actually include a built-in automatic pressure release valve. For the cold water pressure release method, simply remove the pressure cooker from the stove and heat and run cool water over the lid for several minutes in the sink. For natural release, you allow the pressure cooker to cool off in its own time. The natural release method may take quite a bit longer and may continue to cook the food. Therefore, if you have delicate foods that are time sensitive, you may want to consider the cold water method for the Presto to avoid overheating and overcooking the food inside. An extended 12-year warranty, what more could you ask for? The Presto 01362 is one of the only pressure canners that I’ve actually recommended to a close, personal friend. It ticks all of the boxes for home use and comes complete with a massive 12-year warranty – meaning it may just last for decades to come! Click here to see what other customers are saying about the Presto 01362. Reflecting on all of the meals made in my Presto 01362, I am so glad to be able to make use of all of the modern features. Features such as the cover lock indicator, and the fact that it is dishwasher safewhich means that I no longer have to spend hours cleaning up. I can still make excellent, great-tasting food in an astounding time-span with none of the awkwardness and risk of scalding that I used to get when helping my own parents with their meals. I even recommended it to my neighbor who took my advice and hasn’t regretted purchasing the Presto 01362 6-Quart Stainless Steel Pressure Cooker once. The Presto 01362 is a highly durable pressure cooker that I personally have experience of using. I’ve recommended it to my neighbor previously, and I stand by my firm stance that the 01362 is one of the best pressure canners available at the moment. If you are looking for a durable and affordable pressure cooker, then the Presto 01362 is a great option. 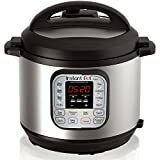 While it may lack in some features you can find with other pressure cookers; you won't be able to find one of this quality at such an amazing price point. The Presto 01362 6-Quart Stainless Steel Pressure Cooker (See Today’s Price) cooks chicken, fish, meat and vegetables perfectly every time. The cooking rack allows flavours to remain separate even when cooking with different foods. Even the economical cuts of meat come out perfectly succulent, tender and full of flavour saving you money in every way possible. That’s not to mention how safe you’ll be as the Presto 01362 automatically maintains the proper cooking pressure with a pressure regulator that constantly gives you the necessary audible signals so that you know exactly when your dinner is done. The cover lock indicator is vital for safety and will prevent the cover being opened until the pressure has been reduced to a safe point. The dual 64 page instruction and recipe book included is an added benefit. As is the fact that the Presto 01362 works on all three range types: gas, electric (smooth-top) and induction, making it suitable for every home. The helper handle makes carrying the Presto 01362 around both that much easier, and safer; easier to carry around your food with a level hand so that there is no sudden uneven distribution of flavour after the food has finished cooking and easier for those who find it more difficult to carry heavy items. 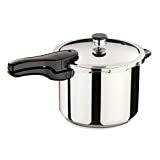 Aside from being dishwasher safe, the pressure cooker itself is made from quality Stainless Steel which gives it a pristine appearance while still being easy to clean. Not to mention the tri-base which sandwiches Aluminium between two layers of Stainless Steel to ensure the highest quality heat conduction, saving time (the Presto 01362 allows your food to be cooked 3-10 times faster than other cooking methods), energy and money by providing an even heat distribution throughout the cooker, and therefore the meal. If you’re still wary about the pressure cooker for whatever reason, Presto also offers an extended 12 year warranty showing just how much they trust it. When using the Presto 01362 myself, one of the things I found to be most helpful was the dual 64 page instruction and recipe book as, not only does it give some delicious recipes for dishes I never would have otherwise tried (I’d personally never heard of Porcupine Meatballs) but it also gives a “Timetable” for each individual food type (Poultry, Fish, Meat, Vegetables and even Custard) which allows you to customise the dishes; you fancy some Brussel Sprouts or the earthy taste of parsnips? Not a problem, that little booklet has it all. My first experience with the Presto pressure cooker shocked me slightly (Why is it rocking?) but I soon found out that it was normal and in fact, that was the time that I was supposed to begin timing the cooking from. When using your Presto pressure cooker it also pays to be mindful of vigorous rocking (turn the heat down) and leaving it unattended on a high setting or for a long period of time, although you can’t leave it for too long as the cooking time is so short, that’s the beauty of Presto’s 6-Quart pressure cooker. Even with larger meals, such as cooking a turkey breast, it only takes 35 minutes. When you begin to smell those oh-so-inviting aromas, remember to remove the pressure regulator before opening the cover, every time. The degree to which your dish should cool in the pressure cooker is also laid out for you in the booklet. And if you think that the lid is stuck, don’t worry the pressure cooker creates an airtight vacuum. Simply place the palm of your hand opposite the cover handle and slide the cover handle back into the closed position before trying again. Your tapioca pudding will be worth the wait. Just two things to note: When the Presto 01362 pressure cooker first comes, you will need to have a Phillips Screwdriver on hand to assemble the handles, it’s no problem, mine was assembled within minutes. Also, the booklet will stress this, but just in case you’ve missed it – always keep the vent pipe clear, this can be tested by shining a light through it. I certainly love my Presto 01362, I use it every day and, thanks to Presto’s 12 year guarantee, I’m guaranteed to have it for a long time to come. Click here to read more Presto 01362 customer reviews on Amazon.com..
Tri-base, the sandwiched layer of Aluminium consistently gives an even heat distribution which is perfect for searing meat. Cooking Rack, the ability to separate flavours allows me to cook my favourite dishes in record time without impairing, or compromising, a single flavour in the meal. Pressure Regulator, the automatic maintenance of pressure saves me a lot of hassle and just knowing that the pressure regulator is keeping both me and my dinner safe makes me feel that more at ease. Helper Handle, this one for me is an impossible feature to overlook, I can’t tell you how many times it has saved my wrists when carrying the finished meal around. It’s so easy to lift with two hands. An extended 12 year warranty, what more could you ask for? The Presto 01362 is one of the only pressure canners that I’ve actually recommended to a close, personal friend. It ticks all of the boxes for home use, and comes complete with a massive 12-year warranty – meaning it may just last for decades to come! Click here to see what other customers are saying about the Presto 01362.. Reflecting back on all of the meals made in my Presto 01362, I am so glad to be able to make use of all of the modern features, such as the cover lock indicator, and the fact that it is dishwasher safe (which means that I no longer have to spend hours cleaning up), I can still make excellent, great-tasting food in an astounding time-span with none of the awkwardness and risk of scalding that I used to get when helping my own parents with their meals. just ordered this pressure cooker. i will never buy anything but Presto brand! I bought another brand @ xmas. 3months and broken!